An urgent call to arms and a makeshift hotline were key in helping Melton RFC bounce straight back from relegation at the first attempt. The club’s First XV wrapped up the Midlands 3 East (North) title with three games to spare on Saturday as Amber Valley were routed at Burton Road. The 13-try demolition job took Melton’s tally to 18 wins and a draw from their 19 matches and gave them an unassailable 16-point lead over nearest challengers Lincoln. The mood of hope and expectation is very different to the gloom which hung over the club 12 months ago when a depleted squad slipped meekly out of the second tier of Midlands rugby. The seeds of change were planted when former chairman John Hill persuaded former junior skipper and Leicester Tigers academy player Marcus Badham to return to his grassroots club. 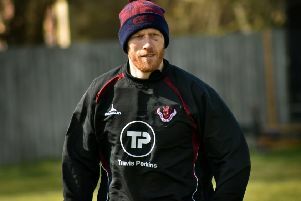 Badham recommended his friend Gareth Collins – on an enforced injury sabbatical from National League Two side Leicester Lions – for the vacant head coach’s position and then set about bringing back homegrown talent. He said: “I was at Syston and had stopped enjoying my rugby. I was going to quit the game, but John Hill told me Melton were really struggling and they could barely get 15 players together. “I told John to get in touch with Gareth and get him on board. It took a lot of phone calls to get the Melton boys to come back to the club, but it did the trick. “My brother Sam came back from South Leicester, Phil Stimson has come back and made a big difference, and there are five or six from our old Colts team like Carl Prior and Klay Radford who have all got back into rugby. “We are a group of mates training twice a week, playing every weekend and enjoying it. The league title may be in the bag, but the motivation remains to finish the season unbeaten and maintain standards for their exciting cup run. And while they are halfway to their target of a famous league and cup double, Badham and Collins have long since targetted the next campaign. They are convinced the team, with a few additions, are strong enough to challenge for promotion to Midlands One. The narrow county cup defeat at unbeaten Coalville, who top the league above, was an encouraging gauge of their prospects. Badham added: “The Coalville game was a free weekend and we had five players away. “Coalville haven’t lost a league game, but we had two tries disallowed and were unlucky to lose. “So we’re aiming to go up again next season. We have a lot of players back now who have experience of higher league rugby.